Despite several arrests, including that of former police chief Kale Kayihura and 10 police officers, questions continue to swirl over who or what is behind the spate of murders. Museveni said Allied Democratic Forces (ADF) rebels are responsible. His ruling National Resistance Movement (NRM) has traded blame with the main opposition Forum for Democratic Change (FDC). Politicial analysts suggest the crime wave could be a manifestation of the widening gap between rich and poor, coupled with widespread corruption. Those who experienced the insecurity across Uganda in the 1970s and 1980s credit Museveni with ensuring their safety in the decades that followed. They traditionally vote in his favor. With the recent spike in urban crime, however, he is seen in some quarters to be losing his grip on national security. Last week, NRM lawmaker Ibrahim Abiriga and his bodyguard were gunned down by unknown assailants in Kawanda, north of Kampala. Abirgia had successfully campaigned to remove the presidential age limit of 75. The bodies of 20 women were found on the outskirts of the capital Kampala after they were kidnapped last year. Police have recorded 70 more kidnappings across the country in the last five months alone. Foreigners have been among the murder victims, most of whom were shot or hacked to death. In March, the bodies of three tourists – two Swedes and a Finn – were found in a Kampala hotel. At first, the government blamed the spate of murders on a feud between national security agencies. After the body of kidnap victim Susan Magara was discovered, with two of fingers chopped off, Museveni sacked Kayihura and security minister, Henry Tumukunde. Riot police are deployed at protests over the murder of kidnapped women in Uganda. Abiriga's apparent assassination alarmed the nation and demonstrations in his constituency of Arua in the West Nile region led to rioting by residents who asked whether the ruling party is still able to guarantee their safety. In its wake, and facing questions from all sections of society, the heads of the police, army and national intelligence went on national television to explain the situation. Defence force chief David Muhoozi said the public anguish was justified. Security minister Elly Tumwine downplayed public fears that the security situation was out of control and insisted that Uganda has seen worse. "There have been bigger challenges before. The insurgencies that have been there are much bigger than these individual murders. In all parts of Uganda people are at home, feasting every weekend. There are marriages, a lot of good things are happening. But once in a while these bad things happen," Tumwine said. Barnard Sabiti, a Kampala-based political analyst, told DW that kidnap for ransom is a new phenomenon causing widespread fear. "You can't feel safe with the kind of crimes you see. You cannot feel safe even if you are a "nobody”. There are just too many incidences. I think you cannot blame people for thinking that they are almost helpless to protect themselves," Sabiti said. He sees the rising number of murders as a possible a "black eye" for Museveni and the ruling party. "There are not so many services the government delivers very well in this country, when you look at health, education, infrastructure. But for a long time a lot of people gave the government a pass – at least when it came to security – people could sleep. That has been the case for over 30 years of Museveni rule. But now that sleep is no longer guaranteed," Sabiti said. "That raises a question of where the legitimacy of the government is left, in terms of governance, because security is what citizens expect from their government." ADF leader Jamil Mukulu is facing charges of terrorism and murder. 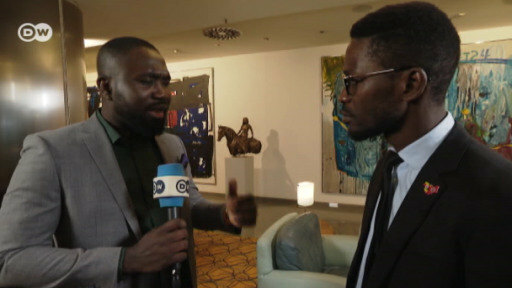 Robert Kayagulanyi, an independent member of parliament, told DW he believes the security situation is deteriorating. "I was attacked with bombs at my home at the time of the age limit debate. The police came and did their investigation. Nothing came of it. The murder of Honorable Abiriga shows that not even the biggest person is safe in this country. Now, as long as the president and his convoy is secure, they claim the whole of Uganda is secure,” he told DW. Defence minister Adolph Mwesige has dismissed public concern over murder and kidnapping. "They happen everywhere. They are not peculiar to Uganda. But I would like to assure the public that they will be ended decisively," said Mwesige. The assassination of Abiriga and his bodyguard came two days after Museveni blamed the spate of murders on the ADF. The rebel group waging an insurgency against his government had shifted from rural to urban areas, taking advantage of a lack of intelligence, Museveni said in his state of the nation speech. "The terrorism of ADF are still there preserved by the United Nations and the Congo government. If however they decided to enter Uganda, they will be decisively defeated," said Museveni. The ADF, which was formed in Uganda and later expanded to the eastern Democratic Republic of Congo, is listed as a terrorist organization. Museveni said he had decided against reintroducing roadblocks. The measure helped bring stability when Uganda emerged from years of political instability in the early 1980s that led to Museveni's toppling of his predecessor, Tito Okello. Police chief Okoth Ochola said some of the kidnappings were used to finance terrorism. "There are a number of wrong guns out there, a lot of hardened criminals, Allied Democratic Front Rebels are just across the border in DRC. Terrorists could be operating near our borders. We are having an exercise to document firearms which are in lawful hands. So that those who continue having illegal firearms will have to be dealt with firmly," said Ochola. Kayihura was taken into custody this week on suspicion of the 2017 murder of assistant police inspector general, Andrew Kaweesi. Ten other police officers are being held in connection with the murder and various other crimes, including kidnapping and espionage. Some NRM politicians have pointed fingers at the FDC. But the opposition party insists Museveni is simply failing to guarantee the safety of the Ugandan people. "He promised to secure CCTV cameras and several other modern equipment to fight murder in the country but all in vain,” said Harold Kaija, FDC deputy secretary general. Yoweri Museveni of Uganda is one of Africa's longest serving presidents. Some political analysts suggest inequality in Uganda may be fuelling the violent crime wave. "There will always be bad guys in the society but the role of the government and everyone else is to ensure that you stop those bad guys from committing crimes. But when you look at the structures of our economy, this is a very unequal society and that in itself can cause insecurity," Sabiti told DW. "We have a very small elite in this country that owns almost everything. We have a group of people that have grown very wealthy over the last 20 to 30 years. At the same time this wealth has been thriving alongside unbelievable desperation in terms of economics." The crime wave is similar to that experienced in other countries where inequality is a major problem, he said. "There are cities on this continent where, when you go out and you come back alive, you have to thank God. Where spectacular kidnappings happen in broad daylight. And it looks like that is where we are headed." A little over a year ago, a report by Oxfam International showed income equality in Uganda was on the rise, with national wealth in the hands of just 10 per cent of the population of 37 million people. The aid organization said the country was one of the most corrupt and estimated it loses 500 million dollars (424 euros) a year as a result. Disaster preparedness minister, Musa Ecweru, has spoken out about the need to curb inequality and corruption. "There are many of us in the NRM who have accumulated unnecessary wealth because we think we are entitled. We need to humble ourselves as NRM. If we keep this sense of entitlement we will ruin this country," Ecweru said warned. Some of the thousands of young people who were trained as "crime preventers" to work alongside police in communities have themselves been accused of crime, including brutal assaults and extortion. Kampala-based security analyst, Fred Egesa, said the use of "crime preventers" - most of them aligned to the ruling party - was bound to lead to security problems. "It seems like we took up security politically and we thought that by employing NRM cadres in security, they can deliver well in security. I think this was a mistake," Egesa told DW. "There was no way you could sustain such a big force on a voluntary basis. Some of those young men have resorted to crime for survival."